Research vessels come in all shapes and sizes for the Woods Hole Oceanographic Institute. Over the past eight decades, the research institute has purchased smuggling ships, converted troop carriers, commissioned deep sea drillers, and built a catamaran out of surplus pontoons. Top image: Lulu, the original support vessel for the deep sea submersible Alvin. The Woods Hole Oceanographic Institute (WHOI) is the world's largest private, non-profit oceanographic research institution. Operating for nearly a century with funding from government grants and contracts, foundation and private donations, and industry contracts, the program has a lot of ships. From support vessels for the human-operated submersible Alvin and the robotic-operated vehicle Jason to speedy day-trippers, custom-built research vessels to retrofitted second-hand ships, the ships of WHOI are a fascinating mix of history and science. Atlantis prioritized silence, steadiness, and cruising range over speed for the best research possible. The name of the first WHOI vessel was passed down to flagship Atlantis II (1963-1996), and now Atlantis III (1997-present). It even made it into orbit with a namesake space shuttle! Designed similarly to a fishing beat and named for a local starfish, the Asterias lugged about scientific equipment for testing over at least 10,000 trips. Caryn may have started life as a smuggler with over 4,000 square feet of canvas, but worked for WHOI doing research cruses around the Caribbean and Bahama. In retirement, Caryn went under the name Black Swan in the charter trade until burning on New Year's Eve 1974. Bear led a colourful life, starting as a military troop carrier before joining WHOI to conduct 152 cruises in the North Atlantic. 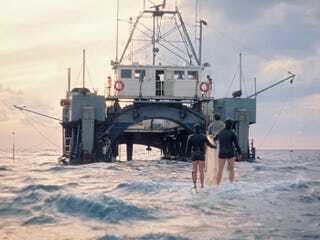 After performing acoustic, bathymetric, and seismic measurements, and participating in fish measuring, the vessel left WHOI for retrofitting as a scalloper. Chain was another military conscript, a Navy salvage vessel recruited into scientific research. It possessed that most valued of assets, seaworthiness, making it a long-favourite of researchers who enjoyed staying afloat. Aras never got the hang of research, completing just 9 legs of a cruise before retirement, but that's to be expected given her past. Commissioned as a private yacht for the owner of a paper company, purchased by the Navy as a patrol gunboat, intended for refitting as an amphibious-force flagship, and derailed into service as President Truman's personal yacht, it's a wonder the ship even survived long enough to get renamed Anton Brunn in honor of a marine biologist when WHOI finally got it 31 years after it was built. Knorr can scoot in any direction or hold position in rough conditions beautifully due to forward and aft azimuthing propellors. Like other WHOI vessels that manage a long service lifetime, the ship features several handy keep-researchers-alive traits like anti-roll tanks and an ice-strengthened bow. As you can guess from its elegant lines and graceful tower structure, Alcoa Seaprobe was built specifically for deep sea research. The rig allowed for coring, drilling, and sampling seafloor to nearly 5,500 meters (18,000 feet), while a search pod could sweep the sea and transmit back to the ship. Tioga is a small, fast aluminum-hulled ship ideal to slip into narrow weather windows to get science done before drowning researchers in foul weather. The boat surveys seafloors with a current profiler, an echo sounder, and water samplers, while a pair of winches can tow underwater instruments behind the ship. All images credit WHOI. Learn more about these ships or other WHOI research vessels here. Have a favourite non-WHOI oceanographic exploration ship? Share a photo or story!